A collaborative event for Leeds Indie Food Festival 2016 by Sarah Lemanski and Izy Hossack. Hosted at Sheaf Street Cafeteria in Leeds. A menu inspired by plants and the part they play in the future of our food. 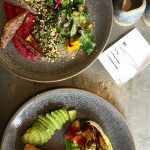 It featured a range of brunch dishes designed to explore and showcase the diverse textures and flavours of all ingredients hailing from the plant kingdom. From nuts and seeds to beans and legumes, right through to flower, foliage and grain. With Veganism set to overtake Vegetarianism as the alternative diet of our times and Flexitarianism on the rise, a booming world population and compromised resources we asked ourselves what will we eat in the future and more importantly how will it taste? The shift towards plant based diets and whole food living is set to be more than just a trend, many argue it will become part of the solution to providing sustainable, plentiful and nutritious food for the future of our planet. This menu set out to reimagine the possibility of plants, out to convince even the most seasoned food lover that rather than restricting what we love it was an opportunity to expand and add depth to our diet, opening up culinary possibilities of a whole new cuisine. Flavour first, forward thinking food for the future.